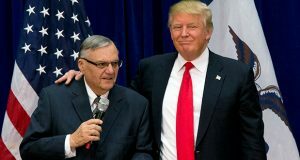 Former Maricopa County Sheriff Joe Arpaio brushed off his recent criminal conviction in U.S. court as a "petty crime" and insisted he won't seek a pardon from President Donald Trump, despite the pair regularly sharing the stage at political rallies during the 2016 campaign. The request came as Sheriff Joe Arpaio's 24-year tenure as sheriff is set to end Sunday. Maricopa County Sheriff Joe Arpaio stood in a cold parking lot outside Park Central Mall on Monday evening and presided over one of his last press conferences. With Paul Babeu stepping away from his county office for a run in the 1st Congressional District, there’s going to be a new sheriff in Pinal County. Maricopa County Sheriff’s deputies on Monday cited Rep. Bob Robson, a Chandler Republican, for tampering with campaign signs, Sheriff Joe Arpaio said today. Sheriff’s spokeswoman Lisa Allen said Robson was cited and released, and deputies are developing a case against the lawmaker.